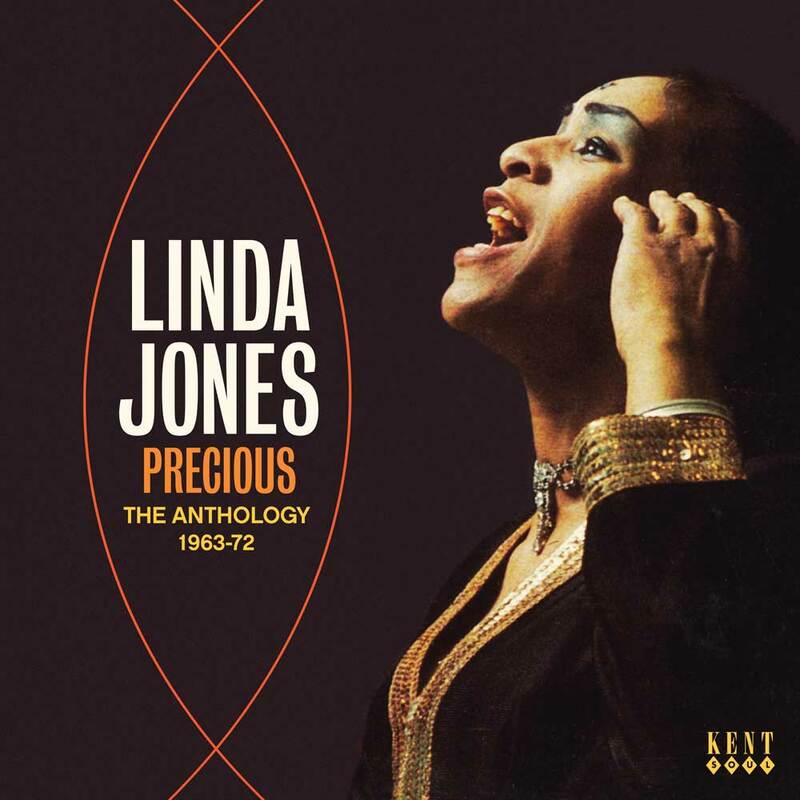 LINDA JONES-PRECIOUS: THE ANTHOLOGY 1963-1976. The story of Linda Jones is one of triumph and tragedy. Growing up, Linda Jones was diagnosed with diabetes. Despite this, Linda Jones went on to forge a successful career as a soul singer. Her breakthrough single, was Hypnotised, which reached twenty-one in the US Billboard 100 and number four in the US Billboard R&B charts in 1967. Suddenly, great things were being forecast for Linda Jones. These forecasts proved prescient. As 1972 dawned, twenty-seven year old Linda Jones was a successful soul singer. She had already enjoyed five hit singles and a successful debut album. This looked like it was just the start of a long and successful career for a singer who had the potential to rival Aretha Franklin, Gladys Knight and Irma Thomas for the title Queen of Soul. Sadly, that wasn’t to be. On March the 13th 1972, Linda Jones was resting at her mother’s home between a matinee and evening show at the Harlem Apollo. She took unwell and an ambulance was called. The following day, Linda slipped into a diabetic coma. Later that day, Linda Jones was pronounced dead on the 14th February 1972. Linda Jones was just twenty-seven. Tragedy had robbed soul music of his its talented and promising singers, Linda Jones. Her career is documented on a new compilation, Precious: The Anthology 1963-1976. It was recently released by Kent Soul, an imprint of Ace Records and celebrates the life and music of Linda Jones. Linda Jones was born on December 14th 1944, in New Jersey. By the age of six, Linda Jones had joined the family gospel group The Jones Singers. They sang in churches in the New Jersey area. This was Linda’s introduction to music. However, as Linda became a teenager, she discovered another type of music…R&B. Discovering R&B transformed Linda Jones’ life. This was a revelation. Suddenly, Linda knew what she wanted to do with her life…sing soul. So when she left high school, Linda had a plan. By days, she worked a series of dead end jobs. Then at night, she became Linda sang in local clubs in Newark, New Jersey. That was where she came to the attention of an A&R scout for MGM Records. He spotted the potential in the nineteen year old Linda Jones. Soon, Linda was signed on a short term deal, and was net into the studio to record her debut single. The song that was chosen was a cover of Lonely Teardrops, which had given Jackie Wilson a hit single. When it was released, MGM billed Linda Jones as Linda Lane. 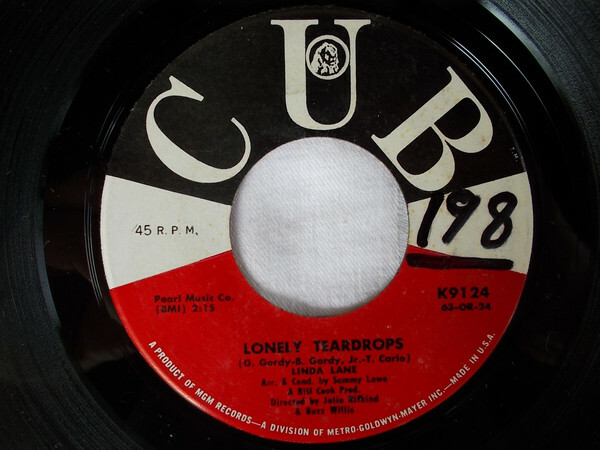 Despite the change in name, Lonely Tears failed to make an impression on the charts. Linda’s time at MGM was over before it had even begun. Despite the disappointment, Linda Jones remained stoic and returned to working dead end jobs by day, and singing in clubs at night. That was where she met Jerry Harris, a staff songwriter at Jobete Music, Motown’s publishing company. Straight away, Jerry Harris realised that Linda Jones was a cut above most of the singers he came across. He promised Linda that he would do all he could to help her. Jerry Harris was as good as his word. 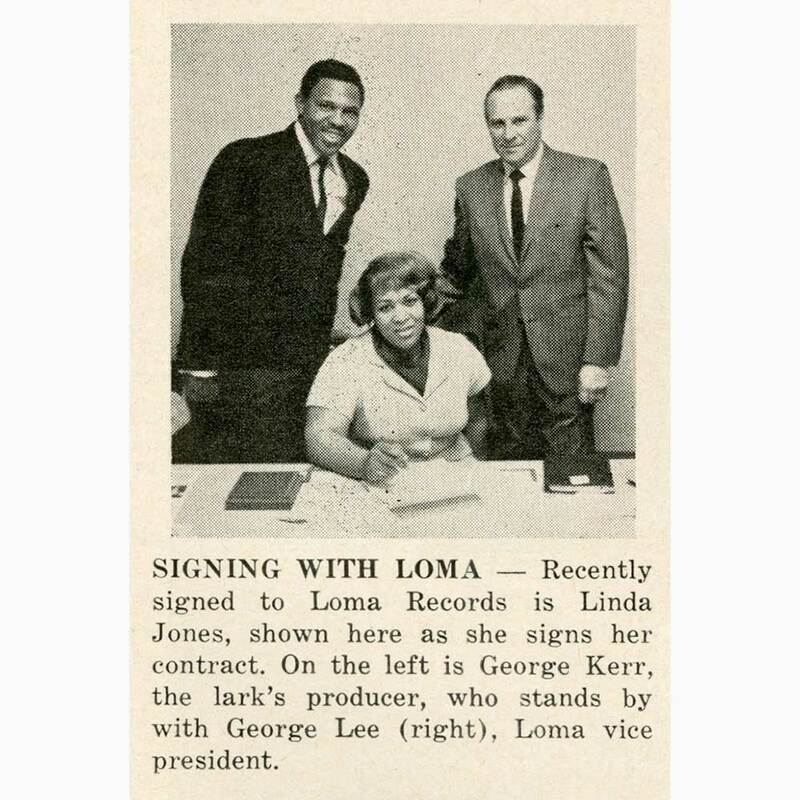 He introduced Linda Jones to producer George Kerr. Little did Linda realise, that this was the start of a six year partnership. Not long after their initial meeting, George Kerr booked a session at a New York recording studio in October 1964. For the session, Jerry Harris had recorded some top session players. The rhythm section included drummer Bernard “Pretty” Purdie, bassist Cornell Dupree and guitarist Eric Gale. They were joined by pianist Richard Tee. This was the band that would be by Linda’s side for the next six years. However, during that first session, Linda recorded the two songs that featured on her next single, Take The Boy Out Of The Country, I’m Taking Back My Love. After the recording sessions, George Kerr shopped the tracks to various record companies. When executives at Atco, a subsidiary of Atlantic Records, heard the two songs, they were keen to sign Linda Jones. When the contract was signed, Linda Jones’ Take The Boy Out Of The Country, was released in March 1965 as Linda Jones’ sophomore single. Tucked away on the B-Side was the heart-wrenching ballad I’m Taking Back My Love. Despite the quality of both sides, Linda’s sophomore single failed commercially. This marked the end of her time at Atco. George Kerr wasn’t about to give up on Linda Jones. After leaving Atco, Linda returned to the club circuit. This was the equivalent of serving a musical apprenticeship. It helped Linda hone her style. Eventually, George took Linda back into the studio, and they recorded Fugitive From Love and You Hit Me Like T.N.T. These two tracks George took to Blue Bird Records. Again, executives at Blue Bird Records liked the two tracks, and agreed to release them as Linda Jones’ third single. Linda was maturing as a vocalist, and combined power and emotion on Fugitive From Love. It became her next single when it was released on Blue Cat Records in July 1966. On the flip-side was You Hit Me Like T.N.T., which later would find an audience on the Northern Soul scene. 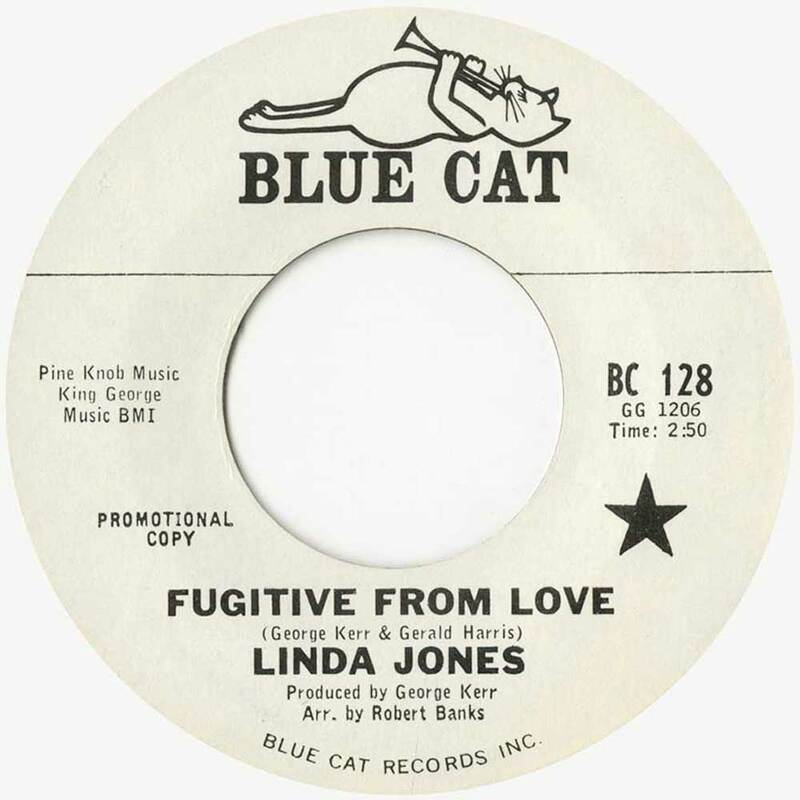 Sadly, Blue Cat Records lacked the funds to promote Fugitive From Love properly. Unsurprisingly, it failed to find an audience, and Linda Jones was once again, looking for a new label. Still though, George Kerr continued to believe in Linda Jones. Undaunted he managed to find the funds to finance another session. One of the songs he planned to record was Hypnotised. George Kerr took Linda and her band into the studio and they cut the two tracks. Then Jerry went looking for a label to release Linda’s fourth single. First stop for George Kerr was Brunswick. However, they weren’t in the market for any more female singers. They already had Barbara Acklin, who they were promoting heavily. However, a Brunswick staffer suggested that George head over to Warner Bros, and meet Ron Moseley. He was working for Warner Bros’ R&B imprint Loma. That’s what George decided to do. At Warner Bros, George Kerr met with Ron Moseley. He took out a copy of Hypnotised and began to play it to Ron. At that moment, Jerry Ragovoy walked past. The song stopped the songwriter and producer in his tracks. He thought it had hit potential. Within a matter of minutes, a deal had been struck. After that, George headed home to Florida. On his return to New York, Jerry Ragovoy and staffers from Loma had been looking for Linda Jones. They wanted her to play some shows to support Hypnotised. This she did, and when Hypnotised was released in May 1967, the single began to climb the charts. Eventually, it reached twenty-one in the US Billboard 100 and number four in the US Billboard R&B charts in 1967. After four years and four singles, Linda Jones had made her breakthrough. This was just the start of the journey for Linda. 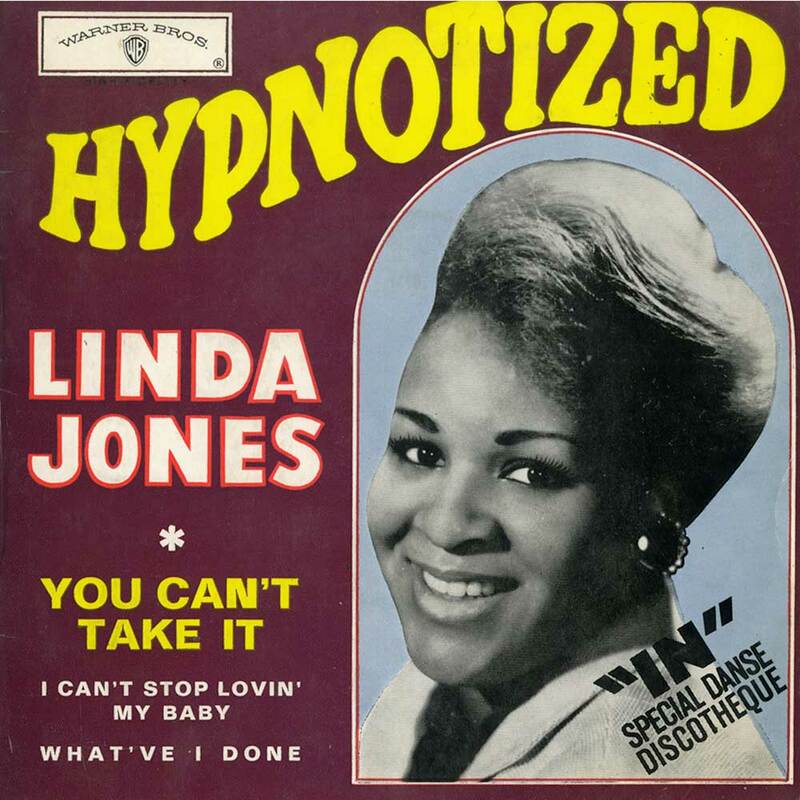 Four months later, and Linda Jones released the followup to Hypnotised was released in September 1967. The song that was chosen was the soul-baring ballad What’ve I Done (To Make You Mad). Again, the single climbed the charts, and eventually, reached sixty-one in the US Billboard 100 and number eight in the US Billboard R&B. 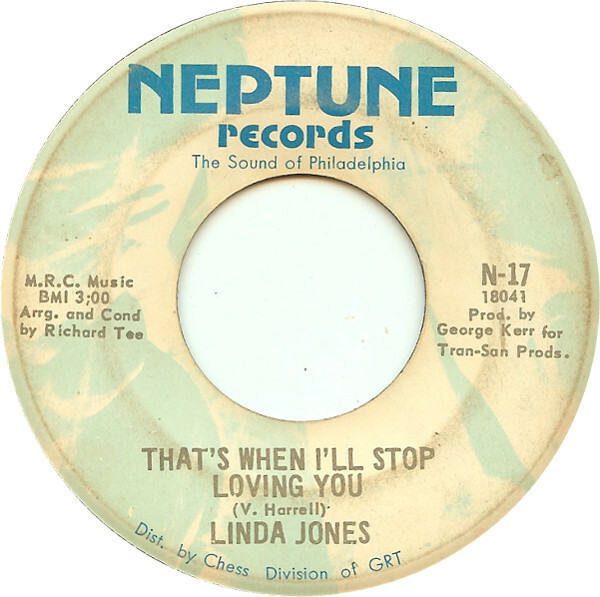 This gave Linda Jones back-to-back top ten single in the US R&B charts. Buoyed by this success, Loma decided to send Linda into the studio to record her debut album. Hypnotised was released later in 1967. It featured the singles Hypnotised and What’ve I Done (To Make You Mad). Other songs included the rueful If Only (We Had Met Sooner), A Last Minute Miracle reached twenty-six in the US R&B charts. By then, great things were being forecast for Linda Jones. As 1967 drew to a close, Linda Jones released her third single of the year. This was the hopeful power ballad Give My Love A Try. This is one of the highlights of Precious: The Anthology 1963-1976. It was released in December 1967. Despite its quality, Give My Love A Try failed to make an impression on the charts. However, 1967 had still been the most successful year of Linda Jones’ career. 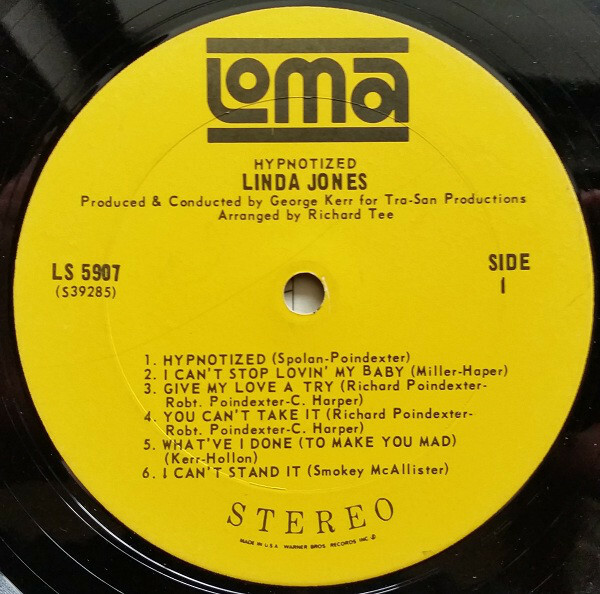 Just two months after the released of Give My Love A Try, Linda Jones returned with her first single of 1968, My Heart Needs A Break. This Sammy Turner composition was produced by George Kerr. When it was released in February 1968, the single charted but stalled at ninety-four in the US Billboard 100. In the US R&B charts, Give My Love A Try fared better, reaching thirty-four. It seemed that Give My Love A Try’s failure to chart had been a minor blip. Or was it? 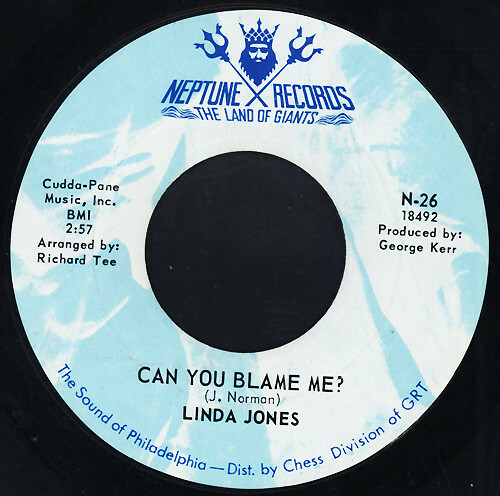 In June 1968, Linda Jones returned with a new single, What Can I Do (Without You). It doesn’t feature on Precious: The Anthology 1963-1976. When What Can I Do (Without You) was released, it failed to trouble the chart. Hopefully, this was another minor blip and the hits would soon resume. 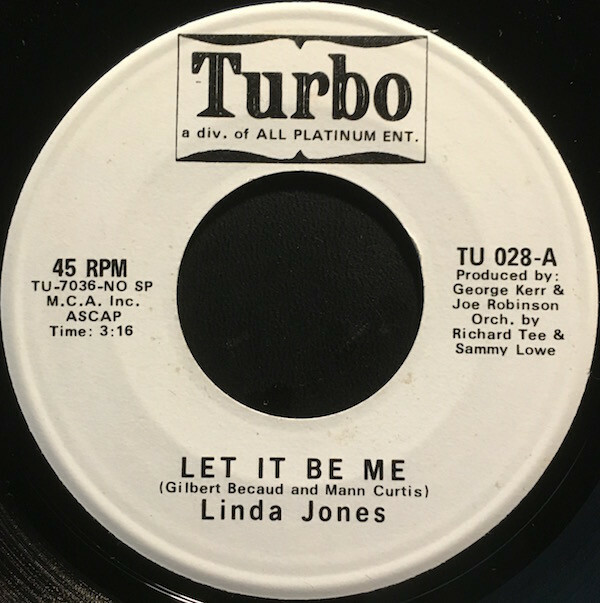 Three months later, and Linda Jones returned with her new single It Won’t Take Much (To Bring Me Back). It’s also omitted from Precious: The Anthology 1963-1976. When What Can I Do (Without You) was released in September 1968, but it too, failed to chart. This was a further disappointment for Linda Jones. Worse was to come. By 1969, Warner Bros. had realised that there was more money to made in rock than soul. Warner Bros. called time on their Loma imprint. It wasn’t part of their future plans. Nor it seemed was Linda Jones. She only released one more single for Warner Bros. This was My Heart (Will Understand), which is omitted from Precious: The Anthology 1963-1976. My Heart (Will Understand) was released the main Warner Bros. label in April 1969. When the single failed commercially, this must have made Warner Bros’ mind up. Linda Jones left Warner Bros not long after this. Later in 1969, George Kerr took Linda Jones back into the studio with her usual band. They recorded a cover of The O’Jays’ I’ll Be Sweeter Tomorrow and That’s When I’ll Stop Loving You. These songs, George Kerr shopped to various labels. Eventually, George Kerr agreed to lease the songs to Gamble and Huff’s Neptune Records. For Linda, this in a step down in career terms. She had previously, been signed to a major label, that was one of the most famous labels in music. Now she was about to release her next single small independent label. The only saving grace was that Neptune Records had signed a distribution deal with Chicago based Chess Records. This should’ve helped get Neptune Records’ releases into more shops than other independent labels. 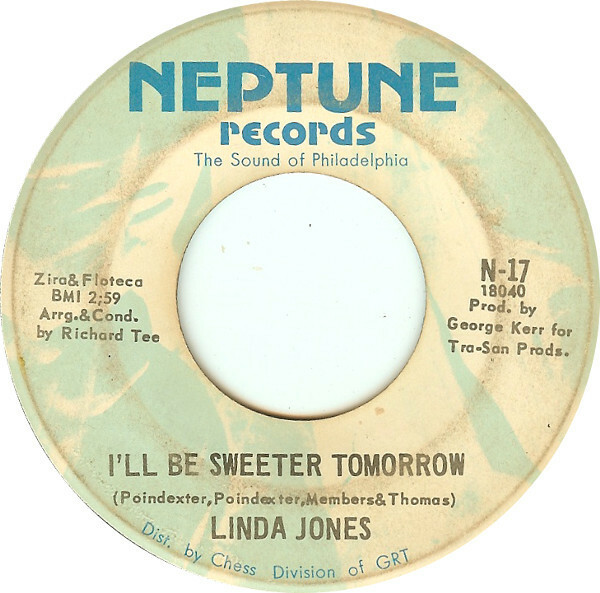 One of these releases was Linda Jones’ single I’ll Be Sweeter Tomorrow. It was released in October 1969, with That’s When I’ll Stop Loving You on the B-Side. Upon its release, I’ll Be Sweeter Tomorrow entered the US R&B charts, and eventually, reached forty-five. Meanwhile, some DJs took to playing the B-Side That’s When I’ll Stop Loving You on the radio. The song became so popular, that it too charted, reaching number forty in the US R&B charts. Linda had enjoyed two hit singles. Maybe Linda’s luck was changing? She was certainly busy with live work when I’ll Be Sweeter Tomorrow and That’s When I’ll Stop Loving You charted in January 1970. Linda Jones was part of package shows that toured America. At each show, Linda appeared three times, singing between three and five songs. This introduced her to a much wider audience. However, this must have been taking its toll on Linda. She had been diagnosed with diabetes at an early age. Like all diabetics, Linda had to take medication and be careful with her diet. Linda had to eat regularly and watch her blood sugar level. Out on tour, this wasn’t always easy, and sometimes, Linda suffered from diabetes attacks. Gradually, they began to happen more often. For Linda and her mother, this must have been a worry. Despite this, the twenty-five year old continued her career. 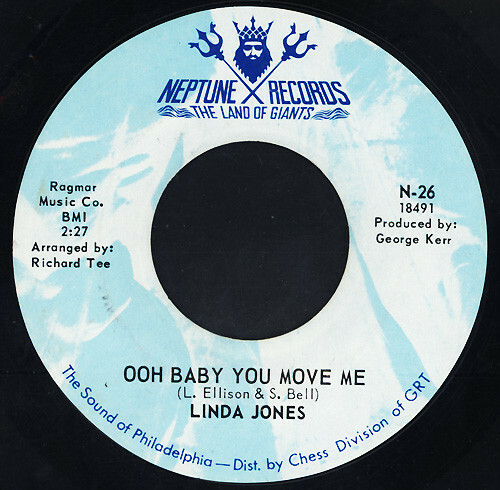 In May 1970, Linda Jones recorded a cover of Ooh Baby You Move Me. It had previously been recorded by Ben Aitken in 1968. On the B-Side, was Can You Blame Me? Again, producer George Kerr decided to lease Ooh Baby You Move Me to Neptune Records. This wasn’t his best decision. At the time, Gamble and Huff were planning on launching a a new label, Philadelphia International Records. Neptune Records was being wound down, so the pair could focus their attention on the new label. Maybe George Kerr wasn’t aware of these plans? As a result, Ooh Baby You Move Me wasn’t promoted properly on its release in May 1970. This proved to be the last Linda Jones record leased to Gamble and Huff. That wasn’t the only change in the offing. Linda Jones moved to Turbo Records, which was a subsidiary of All Platinium Group, a New Jersey funk, R&B, and soul label. This was the start of a new chapter in the career of Linda Jones. However, changes were afoot. 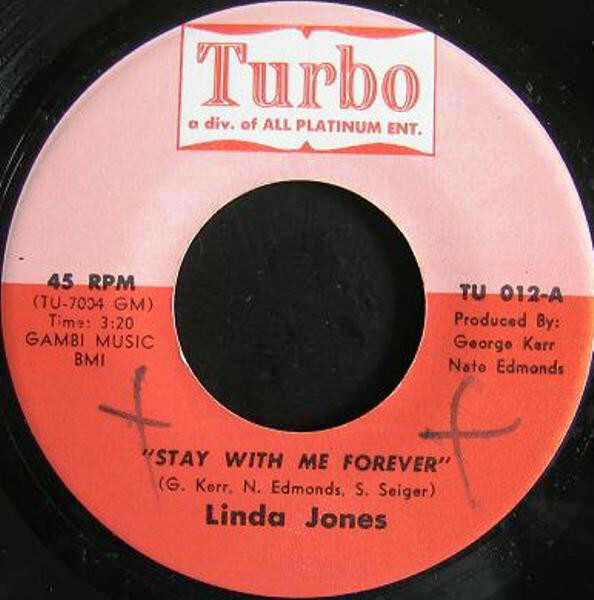 This was Stay With Me Forever, Linda Jones’ first single for her new label, Turbo Records. It was released in May 1971 and featured a vocal tour de force from Linda. She showcased every vocal trick in the book during what was a musical masterclass. The record buying public agreed, and the single reached forty-seven in the US R&B charts. Given the success of Stay With Me Forever work began on the followup. The song chosen was a cover of the Goffin and King composition, I Can’t Make It Alone. It was ‘produced’ by a veteran of the New York music scene, Sylvia Robinson. She would go on to found and become the CEO of Sugar Hill Records. Meanwhile, Al Goodman and Nate Edmonds co-produced the B-Side, Don’t Go (I Can’t Bear To Be Alone). The single was released in November 1971. However, the single failed to replicate the success of Stay With Me Forever. 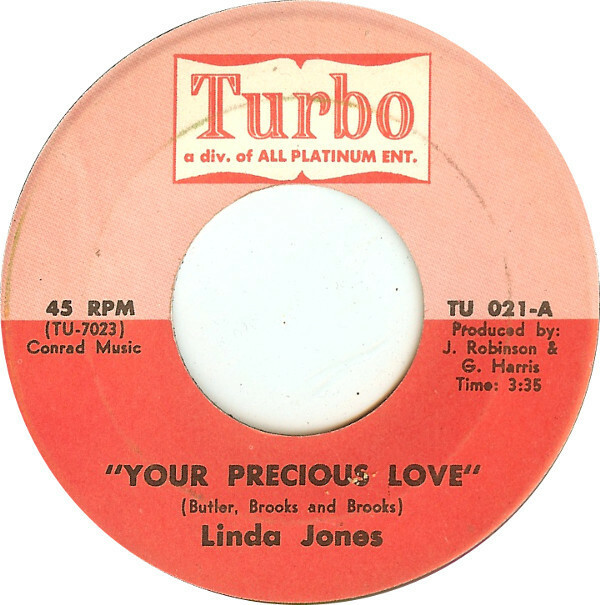 As 1971 gave way to 1972, Linda Jones entered the studio to record her next single, Your Precious Love. It was released in February 1972. Soon, it had entered the charts and began to climb. Then tragedy struck and suddenly music no longer mattered. On the afternoon of March the 13th 1972, Linda Jones performed at a matinee at the Harlem Apollo. She returned to mother’s home, where she lived to rest between shows. That was where tragedy struck. Later that afternoon, Linda Jones became unwell. An ambulance was called and she was taken to hospital. The following day, George Kerr visited the Jones’ household. He was told by a neighbour of Linda becoming unwell and an ambulance taking her to the hospital. By the time George made his way to the hospital, Linda had slipped into a diabetic coma. Later, that day, 14th February 1972 Linda Jones was pronounced dead. She was just twenty-seven. Meanwhile, Your Precious Love continued to climb the charts, reaching number seventy-four in the US Billboard 100 and fifteen in the US R&B charts. 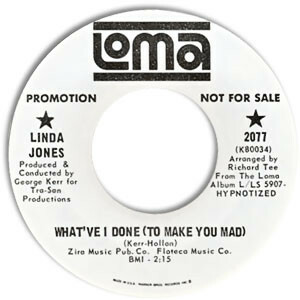 Ironically, this was Linda Jones most successful single since What’ve I Done (To Make You Mad) in 1967. However, Your Precious Love was Linda’s final hit single. 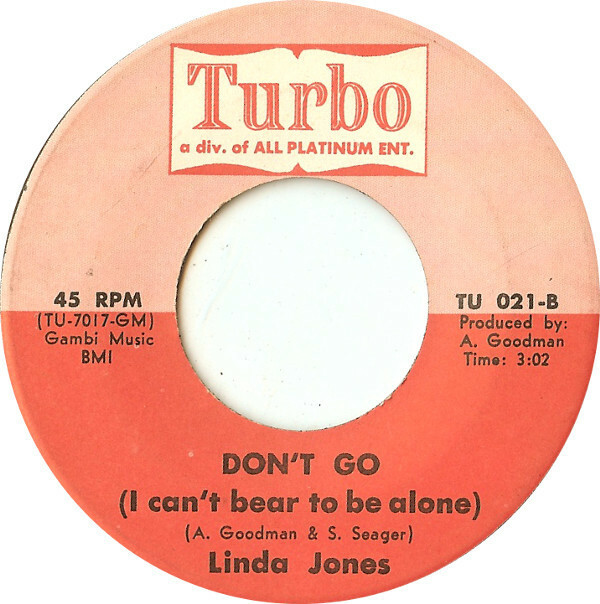 Despite her death, Turbo Records continued to release singles bearing Linda Jones’ name. This included Linda Jones And Whatnauts’ collaboration I’m So Glad I Found You. It was released in June 1972, but failed to chart. That wasn’t the last Linda Jones single Turbo Records would release. Let It Be Me was then released in September 1972. It doesn’t feature on the Precious: The Anthology 1963-1976 compilation. However, it features on an album released by the All Platinum Group, Your Precious Love. It featured number of tracks had been stockpiled during various recording sessions. These tracks were somewhat hastily released as a Linda Jones’ sophomore studio album. Among the tracks that featured on Your Precious Love, were Your Precious Love, Behold, Stay With Me Forever, Not On The Outside and I Can’t Make It Alone. When it was released later in 1972, Your Precious Love didn’t replicate the success of the single. Despite this, Turbo Records released another posthumous album of Linda Jones’ music. The second Turbo Records’ album was Let It Be Me. One of the highlights was a beautiful, soulful ballad I Do. It allows Linda Jones to use her full vocal range. It’s a poignant reminder of a truly talented singer. 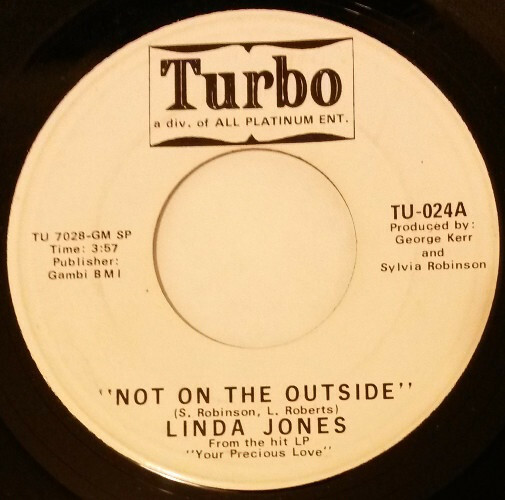 Meanwhile, however, Turbo Records continued to release singles bearing Linda Jones’ name. This included a new versions of Fugitive From Love. It was released in 1973, with Things I’ve Been Through on the B-Side. However, the single failed to trouble the charts. Later in 1973, the single was flipped over and Things I’ve Been Through was released as a single. Still success eluded the single which marked the end of the Turbo Records years. By then, the first anniversary of Linda Jones death was approaching. However, her music lived on. That’s still the case today. Nowadays, her music is growing in popularity, and she is reaching a wider audience. Hopefully, that audience with increase with the release of a new compilation, Precious: The Anthology 1963-1976. It was recently released by Kent Soul, an imprint of Ace Records and celebrates the life and music of Linda Jones. Linda Jones is now remembered for possessing one of the finest and most versatile voices in soul music. If she had lived, Linda Jones had the potential to rival Aretha Franklin, Gladys Knight and Irma Thomas for the title Queen of Soul. Sadly, that wasn’t to be, and Linda Jones died far too young. She passed away on 14th of December 1972. Today, Linda Jones would’ve been celebrating her seventy-second birthday. Instead, today we’re celebrating Linda Jones musical legacy. This includes the music that features on Precious: The Anthology 1963-1976. It’s the perfect introduction to another of soul music’s best kept secrets, Linda Jones.